With 16 people seriously injured and three others confirmed dead, landslides occasioned by rainfalls have buried 105 houses in Indonesia, causing over 300 people to flee their homes out of fear of a repeat incidence. Occurring at about 18:00 pm local time in Lembung village of Indonesia, heavy rainfalls have caused unprecedented landslides in the area, causing massive loss of lives and property. 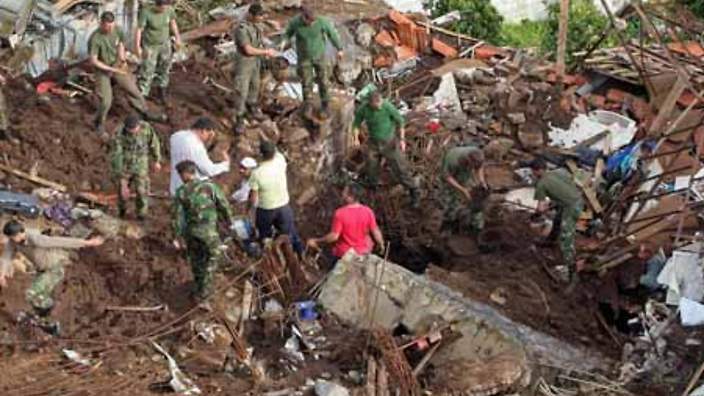 Rescue operations are hampered because of possible landslide reoccurrence, and disaster management officials including the local police, soldiers, agencies, and individual volunteers have not been able to access injured or dead persons trapped under damaged buildings or buried structures. This has made rescue and search operations nearly impossible at the meantime. The spokesman of the national disaster management agency, Sutopo Purwo Nugroho, reveals that several injured persons are currently undergoing medical treatment at a nearby hospital, and that searh and rescue operations will be ongoing until all trapped persons are rescued and brought to safety. Landslides have often occurred in Indonesia before during heavy rain falls, and in two recent occurrences in Central Java, two people lost their lives to the incidents while several people were rendered homeless.